第一，位置离市中心远，每次回酒店都要缴费过河。 第二，清洁度不好，前一天喝的咖啡杯子都不刷。 第三，设施不好，花洒水太小，房间没有Wi-Fi。 First, located far away from the city centre and have to pay the bridge fee every time you go back to the hotel. Second, not clean, failed to wash the dishes and no clean bath towels. Third, no good facilities, the shower head is too small to take a bath, no wifi within the room. 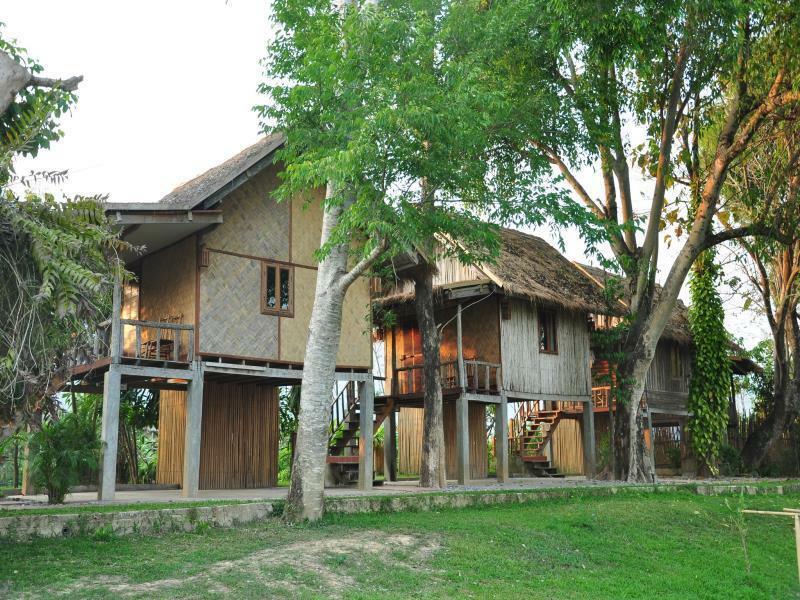 We have stayed in about 30 different places in vang vieng over the years but this was the best - a mountain view bungalow, set on stilts over a rice paddy. You cant see any other buildings from your deck, very peaceful. Only critisism is that for $100 the breakfasts were poor - low quality fried hotdog and cheap ham. Just normal hotel with wonderful mountain view. Staff was helpful and friendly. Shuttle bus from city to hotel every half and hour. I was in bungalow room that quite old and not worth for the price. Breakfast you can pick only one thing in menu. If you love to take a photo of hotel is okay but if it not I literally not recommend this place. 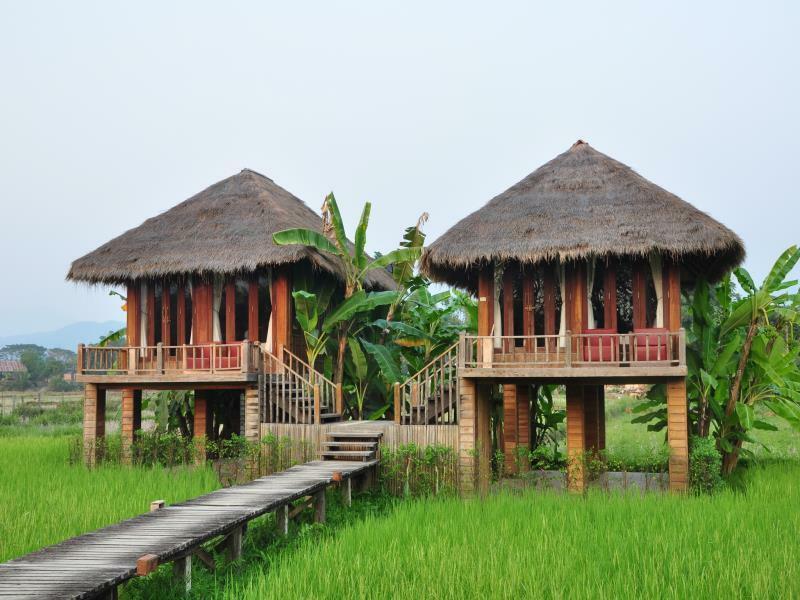 Stayed here 12 December - 14 Dec 2018 Their rice fields are definitely their signature. The view from the lobby t the rice fields is very picturesque and the rooms are gorgeous. Service could be better. For example, I asked the front desk to request a tuk-tuk driver to bring me into town. I was told it was going to be 15 minutes. 30 minutes later the driver never showed. The hotel did take me into town with their own vehicle. My issue is that the girl at the front desk seemed annoyed the next day when I asked her if the same problem would happen when I needed to be taken to the bus station. If it happened once, why wouldn't it happen again? The restaurant breakfast was very filling and I was waited on instead of having to do my own buffet scavenging. I had a pleasant stay. It’s far from the the city about 3-4 km. Nice view, nice staff. The hotel has a shuttle bus for customer, the timeable pick up is 0600-2100. Breakfast is not the buffet,the customer have to choose one manu, another is charged. However, overall is good. We visited in April, which was during their New Year's. The hotel is in a beautiful location with gorgeous views all around. While we were there, there was a large wind/rain storm and the restaurant blew down. The staff did not miss a beat. They took us to a local spot in the morning for delicious breakfast on the hotel. Other than that, I cannot comment on the food since we did not eat at the hotel. The hotel is about a 10 minute walk from the town and their is a toll (50cents) if you walk over the bridge on your own, however there is a free hotel shuttle anytime that you would like. I think they will also bring you back if you set it up, however we just chose to walk back on our own. It is a serene place. If you travel in April, be aware there is a huge concert set up in the river RIGHT next to the hotel for the New Year, so be prepared for music until late into the night. However, I image any other time of year, it is quite peaceful. I would love to stay here again! Beautiful rooms, gardens, vistas. Staff was friendly and helpful. It'seems on the other side of the river from the main town so getting back and forth across the bridge is a slight issue but the solitude of the place is a major plus. 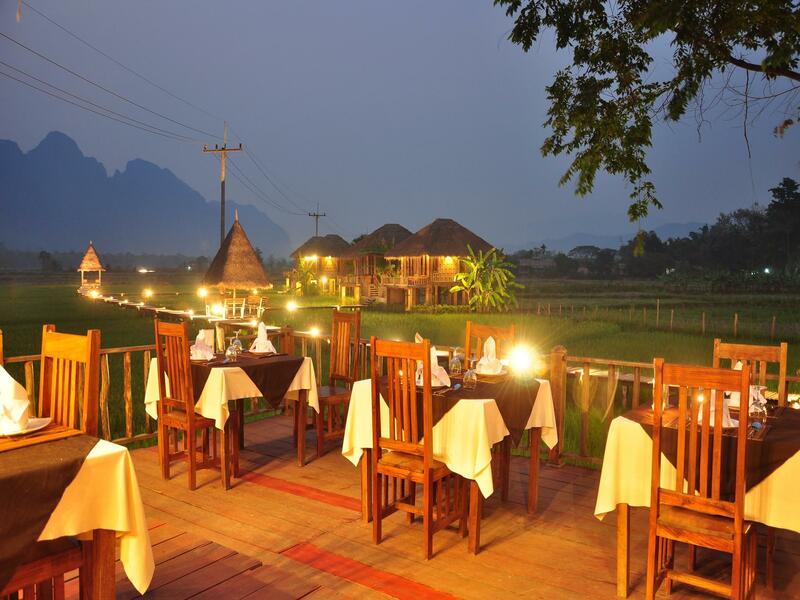 The only good thing about Vieng Tara Villa is it's location. The rest is just poor for the price 130$ / night. I never wrote bad review about accommodation but I feel like I should because I wanna save people's money. The bungalows inside were fine if they were for 50$ but not for 130$. Also it was the only accommodation in Asia I've ever been that didn't have mosquito-curtain which is actually needed here as you are in the middle of rice field. The staff looks like they don't even care that you are there and they totally ignore you. Even don't say "hi". I think they don't know what is the customer service at all and you don't really feel like you are taken care of the staff which I personally enjoy during my holidays (especially if I pay 130$/night!!!) if you know what I mean. The breakfast must be joke. You get NOT really tasty scrambled eggs with two little pieces of old bread and ham + coffee or tea + something that suppose to be orange juice. Money down the drain. Sorry not sorry. Really good ambiance and environment. A little distance to the town but it's walking distance. Can cross the free bamboo bridge to the opposite. Good breakfast. This resort is as beautiful as the photos. The rooms are very clean & nice although 2 rooms complianted no hot water & low pressure. The food is excellent so we decided to have all 3 meals at hotel. Although resort is not at town center but it provides free shuttle service. The town is very small & not much things to do at night other the small night market. 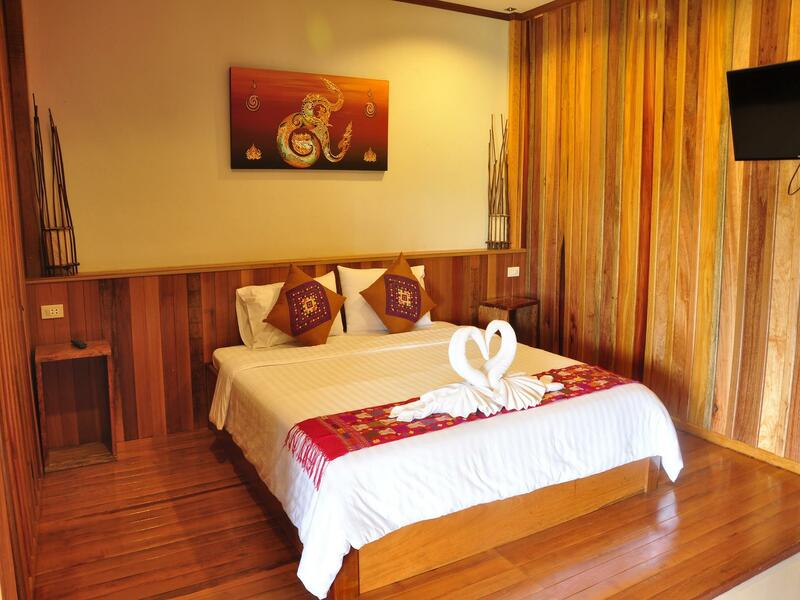 After the outdoor activities in the day, it is best to relex at this beautiful resort.